For states that have expanded Medicaid, individuals are not eligible for APTCs if they are 100-138% FPL. That would explain your highlighted numbers. But yes, I do believe there is some padding encouraged by Navigators. In other words, part of this gap might be a case of expansion state individuals opting for Medicaid vs. exchange QHPs, thus lowering the relative number of exchange enrollees in this income range. The loophole here is that if you estimate that you’ll make 100.1% of Federal Poverty Line for 2015 which is just enough to qualify you for Cost Sharing Assistance Silver Plus plans at 2% of your income and a large subsidy, but your actual reconciled income is 95% of FPL, you’re home free. This is for two reasons. The first is purely pragamatic in that if you are making under poverty line, the ability of the IRS to actually collect anything is fairly low and not worth the effort. 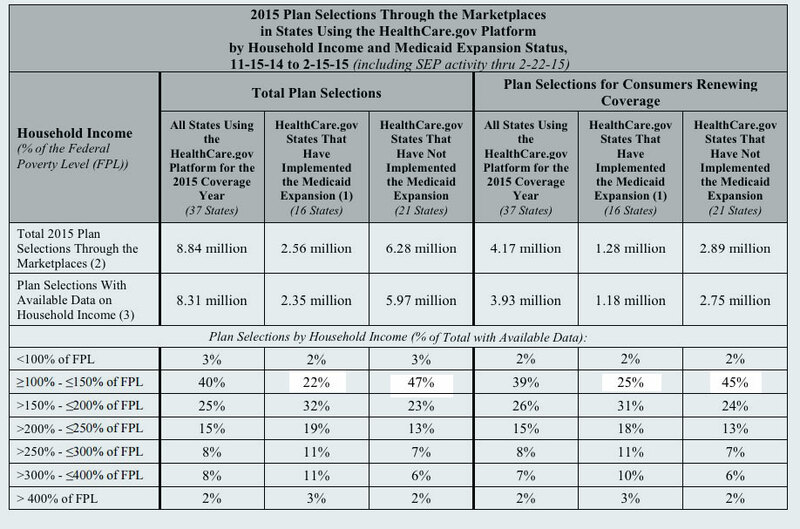 Secondly, it is a soft and incomplete work around to the optionality of Medicaid expansion. I would expect an amazingly high number of people in Texas to have 100.1 to 102% of FPL as their estimated income compared to the same demographic adjusted population group in California. It is an expensive work around as Medicaid is cheaper than commercial insurance, but it helps some people hurt by the assholes on the court. No repayment will be required. According to a Treasury Department rule, if the insurance marketplace estimates that someone’s income will be between 100 and 400 percent of poverty and it turns out that his income for the year is below the poverty threshold, the individual won’t be on the hook for any premium tax credits he received. IF ED had expanded Medicaid, you'd qualify for Medicaid because ACA expansion covers a household of 2 up to around $22,000 in income. However, East DieQuicklington's Governor and/or state legislators are Royal Assholes, so now you're screwed, because you make too much to qualify for Medicaid, but not enough to qualify for a federal tax credit via Healthcare.Gov (or your state-based exchange; believe it or not, there's actually 1 real state, Idaho, which has a state exchange but didn't expand Medicaid). This is the infamous "Medicaid Gap", and over 3.8 million people are stuck in it nationwide. Oh, crap! This couple expects their household income to be literally at the very upper edge of the FPL. Since 100% FPL doesn't qualify adults w/no kids for Medicaid, and Texas hasn't expanded it, they're left out in the cold, with NO healthcare coverage options whatsoever. Woo-hoo!! Look at that, $594 per month in tax credits! Let's go shopping!! First, what about the lowest-priced Bronze plan? Cool--IT'S FREE!! ...except that since Bronze plans don't qualify for Cost Sharing Reductions, they have an absolutely massive deductible before the policy covers a single dime of anything...80% of their entire annual income. Result: The taxpayers pay the insurance company $6,852 per year while the enrollee receives exactly zilch, making this pointless (if they want to pay full price they can skip the hassle and not enroll at all). There we go. They would have to pay $26/month for the premiums ($312/year), but their deductible/maximum out of pocket cost (co-pays, etc) is only $1,500. In short, the maximum this could possibly cost this couple would be $1,812. Now, that may sound pretty good...but again, we're talking about a couple whose combined income is only $15,730 to begin with. For the full year. $26/month doesn't sound like much, but when you're only bringing in $1,310 per month total, that's still a pretty big hit. Throw in the deductible and you're talking about 11.5% of their entire household income (leaving them only $13,918 to actually, you know, eat and such for the year). Actual Medicaid would still be a lot cheaper. THAT'S who we're talking about here. People who are truly desperate. NO ONE else is going to bother trying a "gimmick" like this...and if the states in question would simply expand Medicaid and be done with it, even these folks wouldn't bother doing so. Besides, according to KFF.org, the Medicaid program costs $3,263 per adult in Texas ($6,526 for two adults), which means that it would actually cost the taxpayers less to enroll this couple in Medicaid anyway ($6,526/year vs. $6,852). UPDATE: OK, as Mayhew just pointed out, this last dig (lower cost to taxpayers) may not prove to be the case, since there's no way of knowing whether current adult TX Medicaid enrollees are more or less expensive to treat than the couple in this example. On the other hand, the cost at the Texas state level would still absolutely be lower, because ACA expansion covers 100% of the cost for the next year or so, and 90% after that...whereas "traditional" Medicaid costs TX 42% of the total. UPDATE x2: Thanks to Mark N. in the comments for pointing out that the ACA exchange tax credit also varies depending on the age of the enrollees (since the premium rates vary as well). He suggested that I change the ages from 44/45 to 54/55. When I do that, the tax credit goes up dramatically, to $927/month...because the premium rates also go up dramatically. What this means is that in that scenario, the cost to the enrollees would remain identical (ie, the Bronze plan would still be pointless while the Silver plan would still cost them $26/mo + $1,500 deductible), but the cost to the federal government would go up to $11,124/year. All of which just makes my point even stronger: If the remaining states would expand their friggin' Medicaid programs, they'd save the taxpayers, themselves and the enrollees a whole lot of grief and money. UPDATE x3: It was also noted that I forgot to add the Cost Sharing Reduction costs to the government's tab in the case of the Silver plan scenario above. This would increase the taxpayer cost for these enrollees further...again making simply expanding Medicaid an even better bargain for the states in question by comparison.